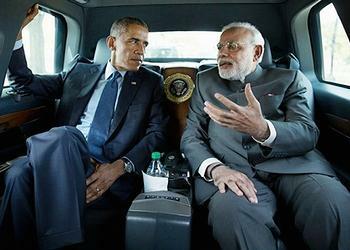 WASHINGTON, DC, September 30, 2014 (ENS) – India’s new Prime Minister Narendra Modi on his first state visit to the White House, today agreed to partner with President Barack Obama in building an effective response to the threat of climate change. 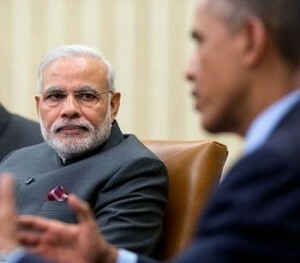 Recognizing the critical importance of increasing energy access, reducing greenhouse gas emissions, and improving resilience in the face of climate change, President Obama and Prime Minister Modi agreed to a new and enhanced strategic partnership on energy security, clean energy, and climate change. This cooperative attitude undercuts the arguments of climate deniers in the U.S. Congress who have said that they should not have to curb climate change because large developing nations such as India are doing nothing to limit their own greenhouse gas emissions. Both countries have newly arrived spacecraft in Mars orbit. NASA’s Mars Atmosphere and Volatile EvolutioN (MAVEN) spacecraft arrived at Mars September 21. MAVEN is the first spacecraft that will explore the upper atmosphere of Mars. India’s first spacecraft launched to Mars, ISRO’s Mars Orbiter Mission (MOM), arrived September 23 to study the Martian surface and atmosphere and demonstrate technologies needed for interplanetary missions. The two leaders agreed on a joint clean energy strategy, under which they will develop nuclear power for India utilizing U.S.-built nuclear power plants in India. The leaders welcomed the conclusion of a Memorandum of Understanding between the Export-Import Bank and the Indian Renewable Energy Development Agency, IREDA, making up to $1 billion in financing available to support India’s efforts to transition to a low-carbon and climate-resilient energy economy, while boosting U.S. renewable energy exports to India. This agreement includes doubling of the upcoming phase of Jawaharlal Nehru National Solar Mission to 3,000 megawatts. They agreed to strengthen and expand the U.S.-India Partnership to Advance Clean Energy (PACE) through a series of priority initiatives, including a new Energy Smart Cities Partnership to promote efficient urban energy infrastructure. They agreed to establish a new program that will scale-up renewable energy integration into India’s power grid; and they will also cooperate to support India’s efforts to upgrade its alternative energy institutes and to develop new innovation centers. The United States and India will create a new Clean Energy Finance Forum to promote investment and trade in clean energy projects. The two governments will expand the Promoting Energy Access through Clean Energy (PEACE) program to unlock additional private sector investment and accelerate the deployment of cost-effective, super-efficient, high-quality, and cost-effective appliances so this energy access can support a broader range of services. The PEACE initiative is to include a new private sector investment initiative with a goal of enabling energy access for a million un-served people and a new focus on mainstreaming super-efficient, high-quality, and cost-effective appliances so this energy access can support a broader range of services. The leaders recognized the need to use the institutions and expertise of the Montreal Protocol to reduce consumption and production of hydrofluorocarbons, HFCs, ozone-depleting gases that also contribute to climate change. They pledged to urgently arrange a meeting of their bilateral task force on HFCs before the next meeting of the Montreal Protocol to discuss issues such as safety, cost, and commercial access to new or alternative technologies to replace HFCs. Obama and Modi launched a new U.S.-India Partnership for Climate Resilience to advance capacity for climate adaptation planning, and a new program of work on air quality aimed at delivering benefits for climate change and human health. The leaders also plan to create a bilateral Clean Energy Finance Forum through which public and private sector officials from both sides can explore specific opportunities to mobilize finance for clean energy. They also launched a new U.S.-India Climate Fellowship Program to build long-term capacity to address climate change-related issues in both countries. The two leaders reiterated the importance of conserving India’s precious biodiversity and agreed to explore opportunities for collaboration on national parks and wildlife conservation. • Energy Smart Cities: Responding to the Government of India’s goals of bringing 24×7 power to all, accelerating the deployment of solar technology, and improving living standards, the U.S. and India plan to engage in a new partnership on energy smart cities that will showcase the policies, technologies, and business and finance models needed to turn clean energy into a commercial opportunity that will draw in private capital and allow commercial scale-up to take off. • “Greening the Grid” – ensuring reliable delivery of clean energy through a stronger, more flexible power system: This new, multi-million dollar, multi-year effort will directly support India’s 24×7 energy access goal through activities aimed at enabling large-scale deployment of clean energy and energy efficiency. This initiative will enable India to absorb big increases in renewable energy generation and position India as a leader in global efforts to reform power systems. • Energy Security: The United States and India will enhance cooperation and information exchange on global energy trends and mutual interests in market stability and promotion of sustainable economic growth. The U.S. government is evaluating new activities that would help India reduce imports, become more efficient, and meet new international environmental standards for fuels. • U.S.-India Partnership for Climate Resilience: The United States and India intend to identify opportunities to jointly advance capacity for strengthening climate resilience, including through development of actionable information, data and tools to help national, state, and local officials with climate adaptation planning. • Air Quality: The United States and India announced a new program of work on air quality to expand joint efforts that deliver human health, environmental, and climate benefits. Possible focus areas include improving air quality monitoring and source identification, assessing the co-benefits of mitigation options, and aiding urban areas in responding to episodic high-level air pollution events. • Reducing Emissions from Deforestation and Forest Degradation: The United States and India agreed to take continued steps to advance the Green India Mission. Among these, the United States will work with India to explore the possibility of placing a Forest Fellow in the Ministry of Environment, Forests, and Climate Change. The President and Prime Minister instructed their senior officials to work through the U.S.-India Energy Dialogue, U.S.-India Joint Working Group on Combating Climate Change, and other relevant groups to advance these and other climate initiatives.